Plastics are a subspecies of a class of materials known as polymers. These are composed of large molecules , formed by joining many, often thousands, of smaller molecules (monomers) together. Other kinds of polymers are fibers, films, elastomers (rubbers), and biopolymers (i.e., cellulose, proteins, and nucleic acids). Plastics are made from low-molecular-weight monomer precursors, organic materials, which are mostly derived from petroleum, that are joined together by a process called "polymerization." Plastics owe their name to their most important property, the ability to be shaped to almost any form to produce articles of practical value. Plastics can be stiff and hard or flexible and soft. Because of their light weight, low cost, and desirable properties, their use has rapidly increased and they have replaced other materials such as metals and glass. They are used in millions of items, including cars, bullet-proof vests, toys, hospital equipment, and food containers. More than a hundred billion pounds of plastic were produced in 2000. Their increased use has resulted in concern with (1) the consumption of natural resources such as oil, (2) the toxicity associated with their manufacture and use, and (3) the environmental impact arising from discarded plastics. ©Martin Harvey; Gallo Images/Corbis. Reproduced by permission. use. Also, the "just in time" approach to manufacture has been made possible by computer-controlled processes, whereby no significant amounts of intermediates are stored, but just generated as needed. In addition, efforts are ongoing to employ "friendly" processes involving enzyme-catalyzed low-temperature methods akin to biological reactions to replace more polluting high-temperature processes involving operations like distillation. Adapted from Oak Ridge National Laboratory. but caution in use is warranted pending further study. Plastics may also result in problems resulting from their improper use, and there is need of better education concerning limitations of use, for example, precautions that should be taken with items such as frying pan coatings and microwavable containers. When exposed to high temperatures, some plastics decompose or oxidize and produce low molecular weight products that may be toxic. There is growing concern about the excess use of plastics, particularly in packaging. This has been done, in part, to avoid the theft of small objects. The use of plastics can be reduced through a better choice of container sizes and through the distribution of liquid products in more concentrated form. A concern is the proper disposal of waste plastics. Litter results from careless disposal, and decomposition rates in landfills can be extremely long. Consumers should be persuaded or required to divert these for recycling or other environmentally acceptable procedures. Marine pollution arising from disposal of plastics from ships or flow from storm sewers must be avoided. Disposal at sea is prohibited by federal regulation. Recycling of plastics is desirable because it avoids their accumulation in landfills. While plastics constitute only about 8 percent by weight or 20 percent by volume of municipal solid waste, their low density and slowness to decompose makes them a visible pollutant of public concern. It is evident that the success of recycling is limited by the development of successful strategies for collection and separation. Recycling of scrap plastics by manufacturers has been highly successful and has proven economical, but recovering discarded plastics from consumers is more difficult. It is well recognized that separated plastics can be recycled to yield more superior products than possible for mixed ones. Labeling plastic items with symbols has been employed, which enables consumers to identify them easily for placement in separate containers for curbside pickup. However, success depends on how conscientious consumers are in employing such standards and the ability of collectors to keep various types of plastic separate. Even a small amount of a foreign plastic in recycling feedstock can lead to the appreciable deterioration of properties, and it is difficult to achieve a high degree of purity. Manual sorting at recycling centers helps, but even trained sorters have difficulty identifying recyclables. Furthermore, manual sorting is an unattractive task and retaining labor willing to be trained for this is problematic. Automatic sorting techniques have been developed that depend on various physical, optical, or electronic properties of plastics for identification. Such methods prove difficult because of the variety of sizes, shapes, and colors of plastic objects that are encountered. Although in principle it is possible to create devices that can separate plastics with varying degrees of success, the equipment generally becomes more expensive with increasing efficiency. Technology for this continues to improve, and it is becoming possible to successfully separate mixed plastics derived from curbside pickup using such equipment. 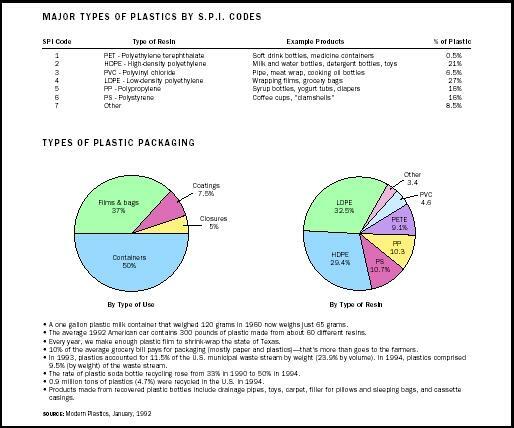 To separate plastics, it is first necessary to identify the different types as indicated in the table. One must also distinguish between thermoplastics and thermosets. The latter, as found in tires and melamine dishes, has molecules that are interconnected by "crosslinks" and cannot be readily melted for recycling unless they are chemically reduced to low-molecular-weight species. For tires, recycling has not proved economical so disposal has involved grinding them up as asphalt additives for roads or burning in cement kilns. Over 1.5 million pounds of plastic bottles were recycled in 2000, representing a four-fold increase in the amount of plastic recycled the previous decade. Nonetheless, the capacity to recycle bottles appreciably exceeds their supply by about 40 percent, so local governments and environmental groups need to encourage greater participation in this practice among consumers. Profitable operations are currently in place for recycling polyethylene terephthalate (PET) from bottle sources and converting it into products such as fibers. One persistent problem, though, is obtaining clean enough feedstock to avoid the clogging of orifices in spinnerets by foreign particles. This has limited the ability to produce fine denier fibers from such sources. PET recycling is also constrained by regulations limiting its use to produce items in contact with food because there had been concern about contamination in consideration of improved recycling techniques. A leading candidate for recycle feedstock is carpets because replacement carpets are usually installed by professionals able to identify recyclables and who serve as a ready source for recycling operations. They face the problem, however, of separating the recyclable carpet components from other parts such as jute backing and dirt. Such recycling operations have been only marginally profitable. declined, so related recycling practices have largely disappeared too. Cafeteria items from school lunchrooms are another potential, but the collection of such objects involves the development of an infrastructure, often not in place. In these cases, it is necessary to separate the polystyrene from paper and food waste, but washing and flotation techniques have been developed for this purpose. The establishment of databases to enable junkers to learn what kinds of plastic are used in what parts of what model cars. A reduction in the number of different plastics used for car construction. The design of cars such that plastic parts may be removed easily (this would require special types of fasteners). This illustrates a general need—the design of plastic-containing products with the ability to recycle in mind. As a consequence of public concern about the environmental problems arising from plastic use, industry is responding to these needs. The effort continues to use fewer different kinds of plastics and to adopt designs that allow for easier recycling but still retain desirable properties. There are, however, some worthwhile products that can be produced from mixed plastic, such as "plastic lumber" used for picnic benches and marine applications such as docks and bulkheads that successfully replace wooden lumber which often contains toxic preservatives and arsenic. But, the market for such a product is limited, so efforts to obtain separated plastics are preferred. Discarded plastics are hard to eliminate from the environment because they do not degrade and have been designed to last a long time. It is possible to design polymers containing monomer species that may be attacked by chemical, biological, or photochemical action so that degradation by such means will occur over a predetermined period of time. Such polymers can be made by chemical synthesis (as with polylactic acid) or through bacterial or agricultural processes (as with the polyalkonates). Although such processes are often more expensive than conventional ones, cost would undoubtedly drop with increased production volume. One success story was the introduction of carbonyl groups into polyethylene by mixing carbon monoxide with ethylene during synthesis. These carbonyl groups are chomophores that lead to chain breaking upon the absorption of ultraviolet light. The polymer is then broken down into small enough units that are subject to bacterial attack. 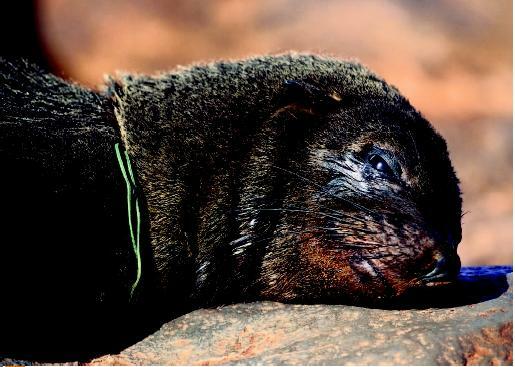 This approach has been successful, for example, in promoting the disappearance of rings from beverage cans, which are potentially harmful to wildlife. A problem with the degradation of plastics is that it is probably undesirable in landfills because of the leachants produced that may contaminate water supplies. It is better in these instances to ship the plastics to composting facilities. This requires the separation of degradable plastics from other materials and the availability of such facilities. In most cases, the infrastructure needed for such an approach is not in place. This has discouraged its use for disposable diapers that are said to constitute 1 to 2 percent of landfill volume. Degradable polymers may have limited use in the reduction of litter and production of flushable plastics, for example, feminine hygiene products, but it seems unlikely that the use of such materials will be a viable means of disposal for large amounts of plastic products. Degradation leads to the loss of most of the potential energy content of plastics that might be recovered by trash-to-energy procedures. A method of plastic disposal with more positive environmental implications is burning and recovering the energy for power generation or heating. Plastics contain much of the energy potential of the petroleum from which they are made, and they, in a sense, are just borrowing this energy that may be recovered when the plastic is burned. Environmentalists and the public have objected to this procedure, leading to legislative restrictions. This has arisen, in part, because of the image of "old-fashioned" incinerators polluting the air with toxic fumes and ash. However, it is possible to construct a "high-tech" incinerator designed to operate at appropriate temperatures and with sufficient air supply that these problems are minimized. Remaining toxic substances in fumes may be removed by scrubbing, and studies have shown that no significant air pollution results. Toxic ash, for the most part, does not arise from the polymer components of the feedstock, but rather from other materials mixed with the polymers as well as from fillers, catalyst content, and pigments associated with the polymers. Proper design of the polymers and crude separation of the incinerator feedstock can reduce this problem. Furthermore, if the feedstock was not incinerated but placed in landfills, contaminants would ultimately enter the environment in an uncontrolled way. Incineration reduces the volume, so that the ash, which may contain them, can be disposed of under more controlled conditions. Also, it is possible to insolublize the ash by converting it into a cementlike material that will not readily dissolve. Facilities for converting trash to energy in an environmentally acceptable way are expensive and at present not cost-effective when considering short-range funding. However, in the long run, they are environmentally desirable and reduce the need for alternative means for plastic waste disposal. It is imperative that legislators and taxpayers soon adopt this long-range perspective. SEE ALSO E NDOCRINE D ISRUPTION ; R ECYCLING ; S OLID W ASTE ; W ASTE . American Plastics Council. (2001). 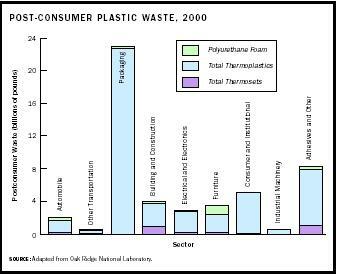 "2000 National Post Consumer Plastics Recycling Report." Arlington, VA: Author. Gerngross, T.U., and Slater, S.C. (2000). "How Green Are Green Plastics." Scientific American August. Hocking, M.B. (1991). "Paper vs. Polystyrene, a Complex Choice." Science 251. Limbach, B.M. (1990). Plastics and the Environment, Progress and Commitment. Washington, D.C.: Society of the Plastics Industry. Piaecki, B.; Rainry, D.; and Fletcher, K. (1998). "Is Combustion of Plastics Desirable?" American Scientist 86: 364. Stein, R.S. (1992). "Polymer Recycling: Opportunities and Limitations." Proceedings of the National Academy of Sciences of the United States of America 89: 835. Stein, R.S. (2002). "Plastics Can Be Good for the Environment." NEACT Journal 21: 10–12. Vesilind, P.A. (1997). Introduction to Environmental Engineering. Boston, MA: PWS Publishing. wat people are doing to our environment is really bad! !